The subject of this episode is Saturn’s moon, Iapetus, and two mysteries about it that various branches of pseudoscience have claimed to solve: the brightness dichotomy via an exploded planet, and the equatorial ridge via a spaceship. This is the first of what I plan to be a series much like “The Fake Story of Planet X” series — different mysteries of the solar system that have a pseudoscientific explanation and may or may not have a real science (agreed upon) explanation. Let me know what you think of the concept. Future ideas for shows are the Pioneer Anomaly and Mars’ crustal dichotomy. Otherwise, there’s a bit of feedback and then I get into the puzzler from last time and one announcement. Well, I sorta snuck in a second announcement — I’m headed to Australia, December 18 – January 20. I’ll be centered in Melbourne (which I enjoy pronouncing as “Mel-born-EE”) for most of the trip though should make it up to Sydney (I wanna see the Great Barrier Reef!). So, dinner in each city if I can round up enough interest. I’m slowly learning that Australia is not just a 5-hr drive across, so I’m less likely to make it to the eastern half. We’ll see if I can increase my Australian listenership in the meantime to make a dinner here or there worth organizing. In the last few days, I’ve seen a few blog posts about Saturn being a young system on the usual creationist sites or those responding to the creationist sites, and being a bit behind in my blog, I thought I’d check out the usual suspects. Predictably, I found the article posted yesterday, May 7, 2009, on the Institute for Creation Research by my own favorite, Brian Thomas (who I picked apart in this blog post. The article in question now is entitled, “Planetary Quandaries Solved: Saturn Is Young.” Okay, I admit I needed to take a deep breath with this one before reading it. After all, you’d think that if scientists had really discovered that Saturn had been created/formed recently, it would be all over the news, right? So right off the bat, the title is misleading, but understandable for a creationist website. Then I picked through some of the references. Why? Because I actually do research on Saturn’s rings. I will be submitting revisions to a 50-page manuscript to the journal Icarus in the next 3 days that should be published in a special edition of the journal at some point this summer, and the conclusions from my simulations are that the ring system is at least 2 times as massive as before, likely more, and the implications are that the system can then easily be a corresponding amount older (e.g., at least 2 times older). What Is the Evidence the Saturnian System Is Old? Let’s ignore all of the outside evidence that it’s old. Let’s ignore solar system formation models. Let’s ignore standard conventional wisdom. Let’s ignore the scientific problems about biblical creation. What is the evidence that the system is old, or at least not young. Well, being a crater counter when I’m not running simulations of Saturn’s rings, I point to craters. Craters are used throughout the solar system as the only cross-planetary method of relative dating methods. In other words, how many craters a solid object has is the only thing that we can measure, at present, that gives us the relative ages of two solid surfaces. Crater ages have been calibrated via Apollo lunar sample returns, and so – at least for our moon – we know that a certain number of craters per unit area corresponds with one age, and a different number corresponds with a different age — and we know what those ages are to reasonable accuracy for the moon. Much work has been done and is being done to try to extrapolate what we know from our moon to other solid bodies, including Mercury, Venus, Mars, and the giant planets’ satellites. While the work isn’t perfect and uncertainties remain, the state of the research is that we can tell the difference between an object that is 6000 years old or 4 billion years old. The surface of Titan? The last number I saw is that there are around 150 impact structures that have been observed, so the present-day surface age of Titan is reasonably young. Yes, I admit that — I’m not hiding it. 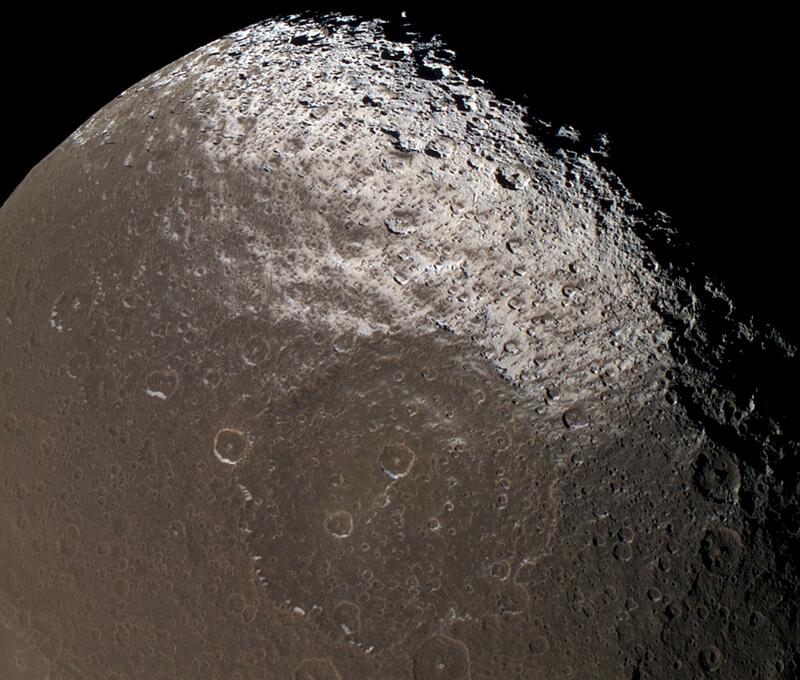 What about the surface of the other moons, such as, say, Iapetus? Well, take a look at the image to the right. 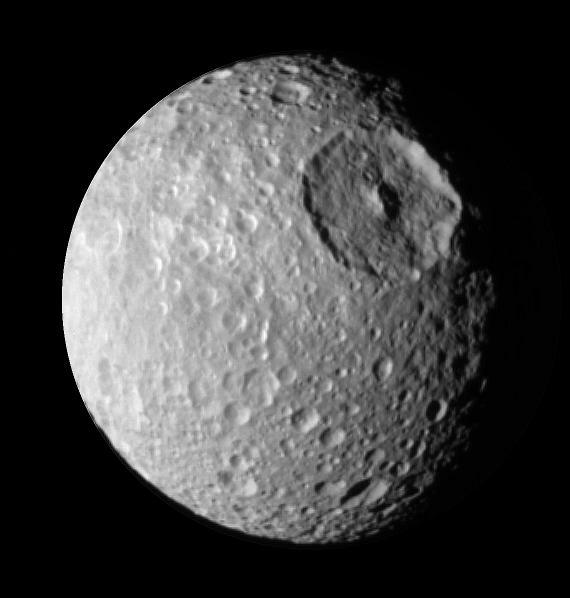 There are A LOT of craters there, and the surface age of Iapetus is likely on the order of a few billion years (I say “likely” because I haven’t actually done the crater counts there). Now, unless you’re going to engage in some very special pleading, this is pretty good independent evidence that at least some parts of the Saturnian system is old. I grew up reading that Saturn’s rings were young – probably formed only 100 million years ago after the breakup of a medium-sized moon, about the size of Saturn’s moon Mimas (shown on the right). That was based on a few things, including estimates of its mass from Voyager data as well as spectroscopic observations showing that the rings are fairly “fresh,” showing relatively little contamination by, basically, space dust. And, this was still an issue in 2006, when I was just starting my simulations. The third paragraph of this article cites Josh Colwell in a presentation he gave. He was listing some of the current problems in a few-billion-year-old rings system, but the problems were still based on old data estimates for both the mass of the ring system and the viscosity of the particles (viscosity can be thought of as how well particles can transfer energy from one to another or how well they flow — water is not very viscous but molasses is). This is true. There are many different parameters that go into these simulations to model the physics involved. Even though I explored a huge range of parameter space in my simulations, performing over 150 different N-body simulations that took over 27,000 CPU hours to run, I still did not explore the whole range of space, and a few of those parameters do affect how ring particles clump together. Clumping is important because it directly affects how we estimate the mass of the rings. If the rings do not clump at all, then for every particle it will block an equal amount of light. Kinda like if you spread a lot of sand on a sheet of paper and you spread that sand evenly around, you will only see a little of the paper through the sand. But, if you use the same amount of sand and start to make little sand piles, you will see more and more of the paper. That’s how we estimate the mass of the rings – by how much paper (how much light) can be seen through the rings. And, if the ring particles are clumped together, then you need many more ring particles to get the same amount of light blocked. What my simulations show is that clumping plays a much larger role than previously thought, and so we need more material in the rings to match the observed light-blockage. Why do more massive rings mean that the ring system is older – or can be older? Because more massive rings means the viscosity is higher and so they spread out more slowly (one of the arguments they were young is that they would spread out too quickly). Also, it means they can be older because the same amount of pollution will get spread out over a larger area, and hence they won’t be as “dirty.” So, arguments that they are young because they don’t show a large amount of pollution can be answered that the pollution is just better hidden than we thought because there is more material within the rings to get polluted. What was the connection to me here? Well, they’re my simulations. And that fourth paragraph has a quote from an article that talked about my results. Hence why I take this a little personally. In paragraph 5 of his article, Brian Thomas says that Saturn’s moon Enceladus “shows no hint of being 4.5 billion years old, but instead appears remarkably young.” I’m not going to harp on Brian’s grammar mistake here because I’m sure I have made my fair share of mistakes in this article grammar-wise, but I will say that it’s a poor journalist who doesn’t know what a sentence fragment is. Anyway … this statement is simply wrong. It is true that the geysers that were discovered coming from Enceladus’ south polar region were a surprise, and they have made many people in the planetary community excited to find out why they are there. (Note – yes, new discoveries that challenge old models make scientists happy, not upset, as creationists would have you believe.) 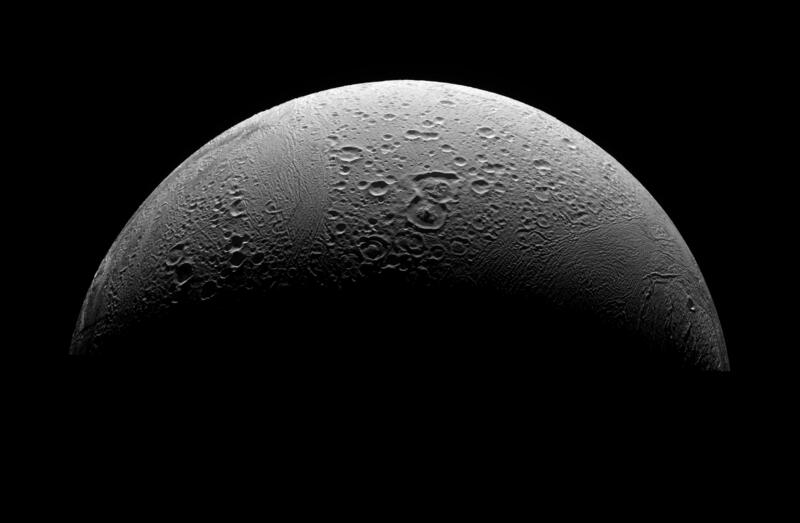 And a lot of Enceladus’ surface does appear to be young. However, a fair portion of the surface also appears to be very old, as shown in the picture on the right. Yes — I’m talking about all those craters. That’s really the point of this article. So, no, the planetary quandary has not been “solved” to say that Saturn is young. Rather, the ring system can still easily be old based on the latest (and if I do say so myself, the greatest) simulations, and even though some features of Enceladus appear young and active, there are other parts of the moon that tell the tale of being ancient.